I am the kind of gal who likes to explore when it comes to makeup because I believe it is a great opportunity to be creative and let my imagination run wild (well maybe not as wild as KISS!!). I see the world of cosmetics as a playground with beautiful shades, seductive textures and inventive products allowing me to accentuate my features as I please. Over the past few years, I have tried various vitamin C products in a quest to achieve brighter and more radiant skin. But up to this day, I could not really grasp the hype behind this cult ingredient. 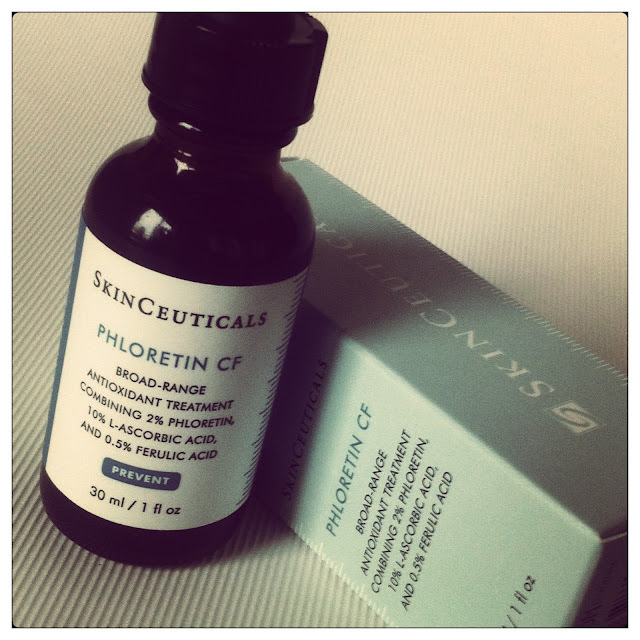 That is when I discovered SkinCeuticals Phloretin CF, a water-based vitamin C serum, which had many promising claims. Developed over five years of extensive research, this broad-spectrum treatment is filled with antioxidants to protect the skin cells from free radicals and photodamage that has already occurred. It is precisely made of 10% vitamin C, 0.5% of ferulic acid and 2% of phloretin, the latter being THE secret weapon of this serum. Phloretin is in fact a molecule derived from the bark of apple trees, which have been found to help skin cells regenerate. Filled with scientific information, I decided to explore on my own and test the benefits of this highly praised beauty elixir. I started to use a few drops of the liquid formulation in the morning on my clean face, neck and hands. I then let it sink in for a minute before applying sunscreen. It gets absorbed very well and dries out to a satin texture. It is important to mention that using a sunscreen following this type of product is crucial because an antioxidant serum doesn't protect the skin from the sun's rays. After having used this product for six weeks, I am delighted to report that I have noticed a reduction of sun spots on top of my cheeks as well as less broken capillaries around my nose. I have far less redness and blotchiness than before. As a result, my skin is now glowing and my complexion is more even than before. As a bonus, I have started to use a lot less foundation than I used to because I don't feel the need to conceal my skin anymore. At $150 CAD a bottle, this powerful formulation is certainly not the type of product you buy on a whim but considering that I have seen more palpable results with this serum than with any other vitamin C products, it is well worth the investment. For more details, visit SkinCeuticals. 1 comment on "An Apple A Day Keeps Dull Skin Away"
Thanks for sharing your experience. I don't know about the number of beauty products that use Vitamin C as an essential ingredient but I do know that quite a few have them. It seems to work. I have heard about using lemon juice as a beauty aid since childhood, so I am not surprised that you've seen good results.